Laminate flooring is a top choice because it is affordable and beautiful. It comes in a wide variety of textures and colors to match any interior decorating theme. And it is a durable option for people with kids, pets, or highly trafficked homes. However, sometimes laminate floors start to lift. Why is your laminate floor lifting and what can you do about it? Whether a homeowner gets costly wood flooring or budget-conscious laminate floors, installation is a critical factor. When a floor is not properly installed, problems can arise. For example, laminate flooring can expand after installation. A flooring professional knows the proper way to install laminate floors in any room or office to avoid this issue. Some rooms or homes get more exposure to moisture than others. Consider a steamy bathroom in a busy home. Or a room that constantly has open windows in a moist climate. There are many reasons why moisture exists in an area. Identifying the moisture and controlling it can help prevent laminate floors from listing. Or work with a flooring pro to get the right installation to minimize the potential of lifting. Flooding can cause laminate floors to lift and get damaged. Keep in mind flooding can be bad for any type of flooring, not just laminate floors. Flooding may occur due to natural weather conditions, plumbing problems, and other factors. Homeowners should always have adequate insurance to cover water damage, including floods. And a pro can fix laminate floors so they look fresh and clean again. When it comes to flooring damage, sometimes the problem is what people cannot easily see. A floor only looks and wears as well as the condition of the subflooring beneath it. 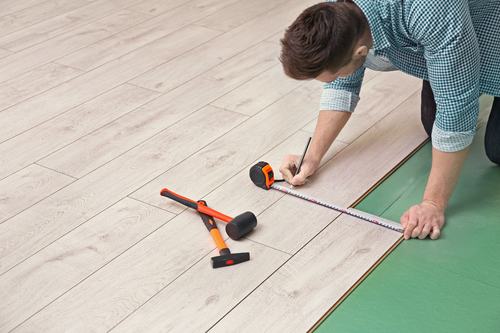 Installing a laminate floor over damaged subflooring could cause lifting and other problems. Plus, a damaged subfloor might look wavy or crooked. Contact a local flooring company to repair or replace the subfloors before any laminate flooring is installed. With moisture in mind, pets may decide to urinate in a certain area on the floor. And you might not know your pet is doing it if you are at work or away from the house. Inspect the floors regularly for odors and moisture. Be aware if your pet is not going outside frequently or when you miss taking Fido for a walk. Urination in the same area can cause laminate floors to lift. Find another area for your pet to take care of business and call a flooring pro to fix the damage. Do you know anyone who asks you to take off your shoes before walking into the house? These property owners do not want their floors or rugs damaged. Muddy shoes and wet feet can cause damage to laminate flooring. Avoid leaving wet shoes on a laminate floor after you come in the door. Have a shoe rack where wet footwear can be stored while it dries. The right installation method is imperative when it comes to laminate floors. For example, when the planks are installed too close together it can lead to lifting. This situation is often referred to as planking. And this also creates a hazardous situation that can cause people to fall and get injured. Instead of trying to install laminate floors yourself, contact a flooring company to get the job done right. Our team of professionals is ready to help you select the ideal flooring for your budget and decor. Let us discuss the advantage of laminate flooring and other options to help you make the right selection.